My Lord, Please Sanctuary Me: Happy New Homeschooling Year? 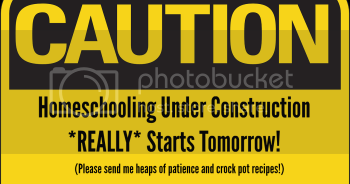 The long break is over and now the work must begin again...and when I write work, in this case, I mean homeschooling. I have been dreading it so severely for the last few weeks that I could not even bring myself to pick up any of the books just to move them! What I have learned is that I prefer organization, but teaching my 14yo is messy, particularly so this year, having we pulled her out of the Home Study Center. I really have not reconciled with her algebra. Do I stick with the textbook the school picked or do I revert back to the one I had picked? What do we need: to review, do the make up assignments, or just start clean in the middle? We discussed it and she wants to make up the work she was originally assigned and, perhaps, this is the best way because it will give her a sense of accomplishment in correcting something where she went wrong. She will learn the math eventually, but this life lesson may more important. I also have to consider changing my record keeping for homeschooling. I have used Homeschool Tracker Plus for years. It has been the best for me and their customer support has always been wonderful. Although at times I would much rather just jot things down on paper, there is the convenience aspect of it compiling records that make it so much easier in the long run. However, Homeschool Tracker Plus is no longer being updated and although it works except for the ISBN feature, I am getting a bit nervous about not being able to access my records with each Windows update...so I will be going to their online version, HSTOnline. My husband is not keen about that either, because he is concerned the records could be lost, but for each subject, we have a logs in the binders of each subject of what was done on each day, from which I type in the info so I have that much on hand. Using the HSTOnline will be easier for me to access with other devices, but it also lacks a few features I like with the Plus version. I probably should buy the license this week and just get it done. Science is the one thing that I have not even begun to consider other than getting a membership at a science museum about an hour away. I have the full set of books with lab and teacher's edition of the textbook the Home Study Center required, but I have not had to do anything much with science for the last two years, so.... Well, I just have not even looked at that book yet to make any decision, but I was thinking that it would be good to do more experiments, most simple ones. I have a number of homeschool books with simple science experiments with common items that we could do and then next year she could take a science class. There is another school for homeschoolers not far from the one we have been going to that will be half the cost, because there is no science retreats, and we can choose any classes as long as they do not conflict in time. This one has lots of electives from which to choose and only has classes on Tuesdays, so that is what we are looking into for next year...maybe. Four years more to homeschool. Well, less than that as we are in one of those four now. It seems such a very short time to prepare my daughter and it seems such a long time to get through. My Lord, remind me daily what if most important about educating my daughter.